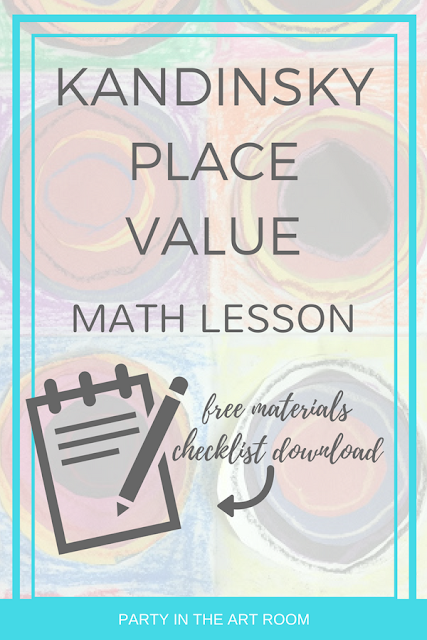 Here's a great arts integration lesson plan for teaching place value. Students analyze Kandinsky's Color Study: Squares with Concentric Circles, which is commonly known as Kandinsky's Circles. Jumping In is a great method to use with students to help them analyze the work. They pretend to jump in and imagine what they would experience using their five senses. From this activity, it is best to steer a class discussion in the direction of line, shape, and color. When a student says something like, "I smell something hot," as their response to the Jumping In exercise, I will ask them why. It is so important to always have students justify their claims about artwork. The student might say, "Because there is a square full of orange, red, and yellow circles on the bottom. Those colors make me think of hot sauce." Then, I will ask the student to think about what kinds of colors those are, and if they don't know, I will tell them those are warm colors. I will help them make the connection to how warm colors make us think of things that are hot. Students will apply these concepts of color theory as they work on their own pieces. Students will represent place value concepts in their artwork. So, they will need to determine what numbers they will use and how to represent those before they start the artistic process. Have them write down four numbers with as many digits as you decide to be appropriate. The number of digits will correspond to the number of columns in their work. The value of the digits will correspond to how many circles are used in each square in each row. Let's say a student chose 4,351 as their first number. The top row of their artwork would have 4 circles in the first column, which represents the thousands place. There would be 3 circles in the second column, which represents the hundreds place, and so forth. The next row would represent another four-digit number. However, if students are working with three-digit numbers, there would only be three columns, etc. These students made their own artistic decisions about how to place the circles inside each square. As you can see, not all students chose concentric circles. AND, Kandinsky Dance Curves Resource List. AND, more arts integration lessons featuring Kandinsky.